Vendors include any businesses, clubs, organizations, or individuals, who wish to set up a booth or tent at the event with items for sale. Clubs not selling merchandise of any kind (selling memberships is ok) may have a free vendor space. The Camp Oakes personnel have requested that NO pets will be allowed in the camp unless it is a licensed service/therapy animal. This is for liability reasons and for you and your pet’s safety. They will ask you to leave if you bring a pet in to the camp that is not a licensed service animal. We greatly appreciate your understanding and following the Camp rules. vendors must also register and pay for any person coming into Camp Oakes to work in their site beyond the specified number for each vendor site that is included in the vendor booth fee, or otherwise attend the conference. See vendor registration form for more information. is required to sell items. Operating without a permit puts the RTMC, Inc. at risk. If you do not already have a permit, you may apply for a temporary sellers permit. For information see: https://www.ca.gov/service/?item=Apply-for-Sellers-Permit. 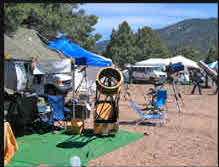 Swap meeters set up in the Swap Meet area on Saturday need not pay site fees or have a resellers license. Registration for a vendor site must be submitted no later than Friday, August 23rd, 2019. Any late registrations after August 23rd my be approved by contacting Teresa Bippert-Plymate at the address below for special arrangements. Vendor sites do not include lodging or meals for attendees. Any attendees beyond the specified number for each vendor site must register separately and pay for General Admission or Single Day Admission. Meals will be available from a menu, a la carte. Please notify the RTMC in writing/email no later than August 31st for Premium sites or no later than September 9th for general registrations. Paypal services are not refundable. Premium sites are not refundable after August 31st. No refunds are given due to weather related issues. Includes: Regular vendor site (no tent, chairs, or tables included) and entry for two participants. Sponsors will be listed on the Home page of the RTMC AE Web site, with a link to the sponsor’s Web site, if applicable. Sponsor logos may also be included on the RTMC AE Web site’s Home page. Sponsors and logos will also be included in the printed registration form if they have been received by January 15th. Logos should be between 800 and 1200 pixels wide in the longest dimension and should be submitted in GIF, TIFF, JPEG, or BMP formats to the address below. Sponsorship does not include lodging or meals for attendees. Any attendees beyond the specified number for each sponsorship level (six for Galaxy, four for Nebula, two for Star and Planet) must register separately and pay for General Admission or Single Day Admission. Meals will be available from a menu on a cash basis only.